The NDP had a clean slate here. They also promised to adhere to UNDRIP; an international protocol that calls for Indigenous People's consent for these sorts of decisions. Since SiteC is in dispute with several northern First Nations, we can safely assume that this consent isn't quite satisfied. Putting it mildly. So expect years of high level litigation ahead. Members and supporters of the NDP were given the impression that SiteC's fate would be determined as a result of the BCUC review. By rights, it should be cancelled. But it now has a green light. Those who invested their time, money and vote in the NDP will likely recoil at this. Their party is in power and has the power alone to continue or cancel the project. NDP folks by in large part will feel very let down by this. While its true that the party and leader never explicitly said that SiteC would be cancelled, they left that door open by putting it in the hands of the BCUC upon taking office. I can't help but draw a parallel in time to another moment in history where NDP supporters were let down so heavily by their own government. I go back to Bob Rae's Social Contract in Ontario. Through no fault of their own, public sector workers got hit hard with the Ontario NDP government using the legislature to open up signed contracts to cut wages and impose unpaid leave; all to help trim costs in a budget deficit they didn't create in an economic crash they didn't trigger. The result was an alienation of union and traditional NDP supporters walking away from the party, many of whom never returned. What will be the communication that the BC NDP goes with on re-selling SiteC? If we're to get a dam we overtly campaigned against, will we get a forensic audit of BC Hydro? Surely some shady things went on there. Will we get an end to the practice of siphoning* large funds from the Crown utility to pad an imaginary budget surplus? The NDP also campaigned on their own document, "PowerBC". Its a good and compelling read. If we're to have this dam, move full speed ahead with PowerBC too. I will recognise how difficult this is for the NDP. Either side of this was going to be upset regardless how the choice went. I'm no financial guru, but the implications of cancellation vs continuing must be that elephant in the room. What happens to the billions of dollars spent on a project you cancel? Its effectively written off. That's a significant charge of debt to the taxpayer. Uncharted territory. Brace yourselves everyone. 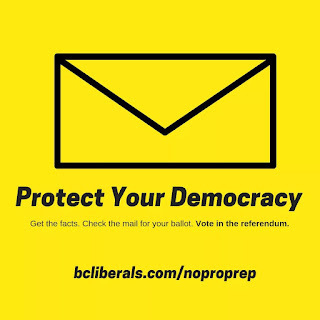 * the practice is not unique to the BC Liberals. Several provincial governments have taken a "dividend" from otherwise profitable Crown Corp as part of the general revenue, but the Campbell/Clark regimes took it to an extreme level. Crown Corporations became tax collectors.